In studying the history of the vernacular in worship beginning with the Christian Scriptures, Dynamic Equivalence uncovers the power of a living language to transform communities of faith. How we pray when we come together for common worship has always been significant, but the issue of liturgical language received unprecedented attention in the twentieth century when Latin Rite Roman Catholic worship was opened to the vernacular at Vatican II. Worshiping in one's native tongue continues to be of issue as the churches debate over what type of vernacular should be employed. 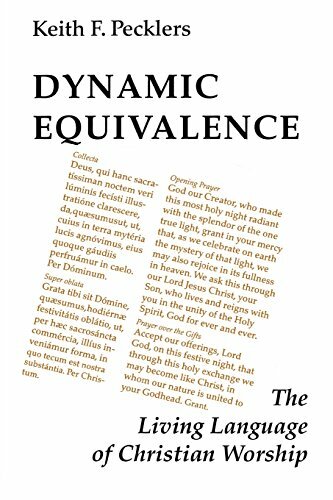 Dynamic Equivalence traces the history of liturgical language in the Western Christian tradition as a dynamic and living reality. Particular attention is paid to the twentieth century Vernacular Society within the United States and how the vernacular issue was treated at Vatican II, especially within an ecumenical context. The first chapter offers a short history of the vernacular from the first century through the twentieth. The second and third chapters contain a significant amount of archival material, much of which has never been published before. These chapters tell the story of a mixed group of Catholic laity and clergy dedicated to promoting the vernacular during the first half of the twentieth century. Chapter Four begins with a survey of vernacular promotion in the Reformation itself, explores the issue of vernacular worship as an instrument of ecumenical hospitality and concludes with some examples of ecumenical liturgical cooperation in the years immediately preceding the Council. The final chapter treats the vernacular debate at the Council with attention to the Vernacular Society’s role in helping with the implementation of the vernacular. If you have any questions about this product by Brand: Liturgical Press, contact us by completing and submitting the form below. If you are looking for a specif part number, please include it with your message.